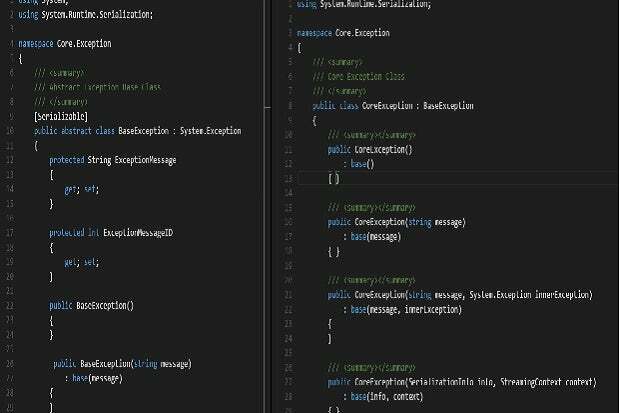 Microsoft released its first cross-platform code editor named Visual Studio Code recently. The software giant has recently launched the preview version of its fast, easy to use, cross platform code editor named Visual Studio Code. The announcement was made at the Build developer conference 2015 held at San Francisco, CA. I have been exploring this tool -- simply awesome! In this post I'll share my thoughts on Visual Studio Code. In my future posts here, I'll discuss more on how we can use this code editor to build and debug applications and leverage its features. What is Visual Studio Code? Why do we need it? Visual Studio Code is a lightweight, cross-platform code editor that you can use in Windows, Linux, or OS X platforms to build modern applications for the Web and cloud alike. A preview version of Visual Studio Code is available for free. Visual Studio Code combines the simplicity and power of an elegant modern code editor with support for an integrated navigation and debugging experience sans the need of a full featured IDE (Integrated Development Environment) like the popular Visual Studio IDE. Visual Studio Code is built on an architecture that provides excellent support for code analysis of your C# code. This Channel9 video provides a nice discussion on Visual Studio Code. The official Visual Studio Code documentation states: "Visual Studio Code provides developers with a new choice of developer tool that combines the simplicity and streamlined experience of a code editor with the best of what developers need for their core code-edit-debug cycle. Visual Studio Code is the first code editor, and first cross-platform development tool - supporting OSX, Linux, and Windows -- in the Visual Studio family." Microsoft's vision with Visual Studio Code is providing a simple, fast, cross-platform code editor for building Web and cloud applications. Visual Studio Code contains all the standard features you would want a modern code editor (code assistance, code navigation, refactoring, etc.) to have with excellent support for ASP.Net, Node.js, and TypeScript and also support for Git out of the box. You can follow Visual Studio Code on Twitter. Editor: This is the actual code editor where you can open and edit your code files. Support for Side by Side Editing is one of the most striking features in Visual Studio Code -- you can open up to three editors side by side. You can also re-size, reorder and reposition the editors if need be. The Explorer Window in Visual Studio Code is used to open and manage the files and folders. You can take advantage of this window to create, move, delete and rename files and folders. You can save changes you made in the editor using the key combination Ctrl + S. You can also turn Auto Save on in which case the changes you make would automatically be saved onto the disk. You can turn on auto save using the key combination Ctrl + Shift + P.
Visual Studio Code also enables you to search a text in files or folders - you can exclude one or more folders in your search as well. To invoke search you need to use the Ctrl + Shift + F key combination. File Navigation is another important feature provided by the Explorer in Visual Studio Code - you can navigate in and across files easily. You can view a list of the files that have been opened thus far by using the Ctrl + Tab key combination. If you would want to open a file by its name, you can use the Ctrl + E key combination.